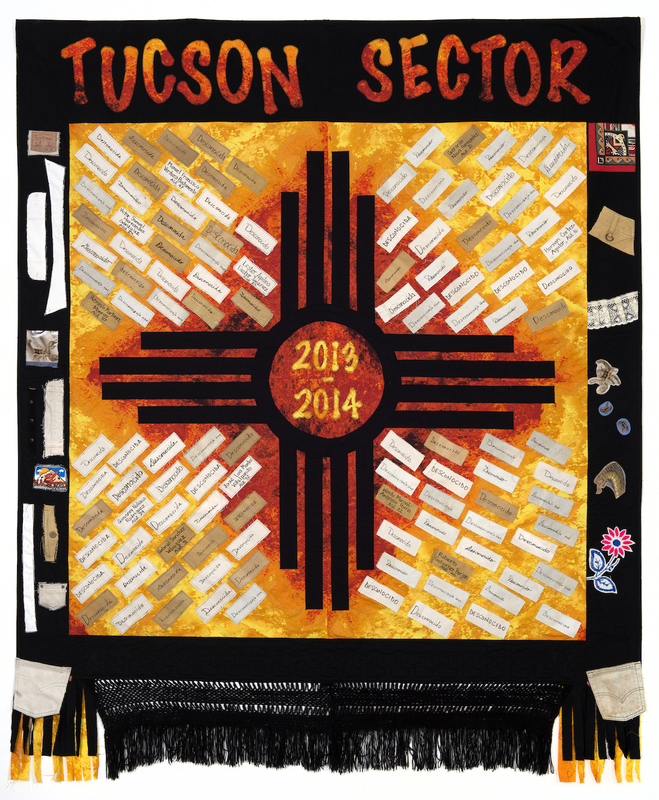 My name is Dana Hollifield and I worked on this quilt with Debbie Maloney and Linda Knapp. We began the design process in September of 2015 and completed the project in November of 2015. Debbie’s goal was to hand deliver the quilt in January of 2016 during an annual church mission trip to the border. We chose the Zia image which symbolizes many things. First and foremost , it is a sacred symbol. It was found on a pottery piece in the Zia Native American Pueblo during the 19th century. It represents the sun with groups of rays pointing in four directions. Four is the sacred number which symbolizes the Circle of Life, the four directions, the four times of day, the four stages of life, and the four seasons. Lastly, we chose it because it is also on the New Mexico state flag. 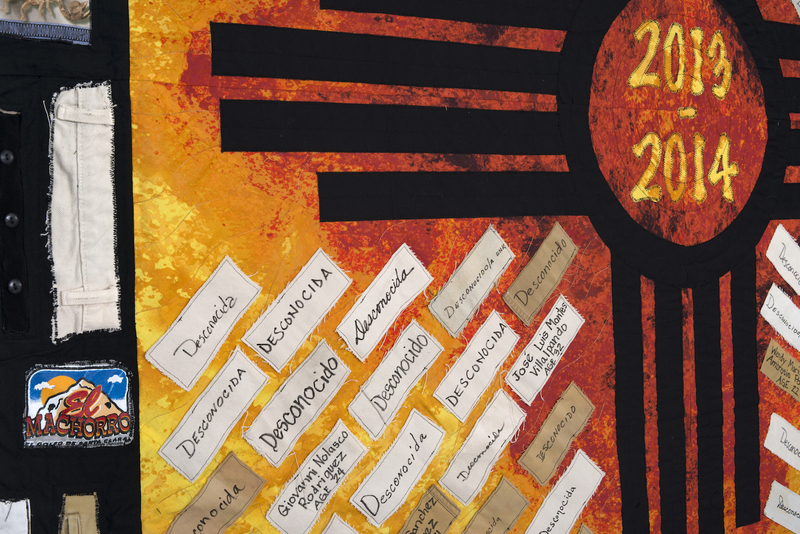 The group consists of members of the United Church Santa Fe in Santa Fe, New Mexico. Once the overall design was confirmed, we divided the quilt into four quadrants for each of us to work on simultaneously. The design process began with choosing the back ground fabric. We wanted to maintain a yellow and red color scheme. We found the perfect back ground fabric which had gradations of yellow, orange, and red at the local quilt store. It was then cut on the bias and pieced in a way to mimic the suns rays radiating from the center. The Zia symbol was done in a black fabric. The sun’s rays are represented by small rectangles of fabric cut from the pants that were provided. Debbie enlisted members of the church to hand write the names and dates provided to us, on these small rectangles. They were then sewn on the diagonal in each quadrant. 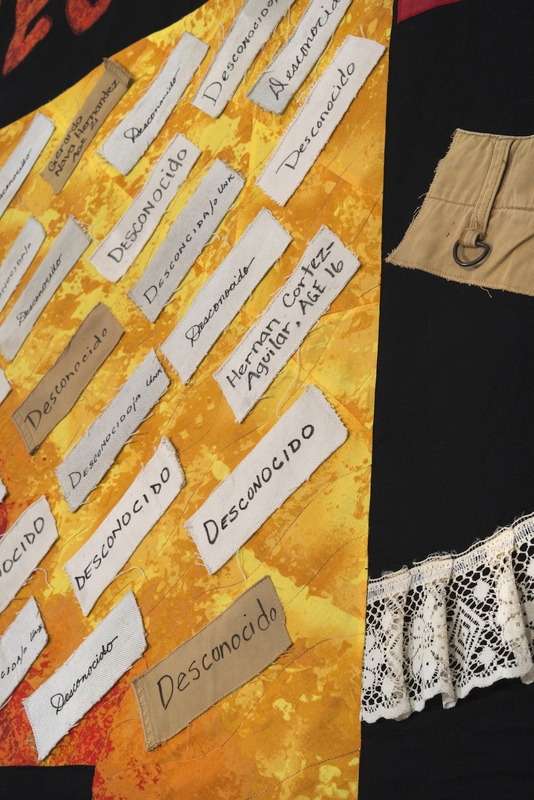 The side borders include a random display of different clothing items. The bottom border is made from the fringe of a shawl. For me it was a very emotional project unlike the long arm quilting projects I complete for friends and clients. As I worked, I imagined the heat from the sun parching the skin of each individual, the pain and agony of crossing a barren desert without water, and ultimately perishing in an attempt to reach a place safe without fear. These individuals came during all four seasons, in all stages and ages of life, struggling night and day, in a fruitless attempt, unfortunately completing there abrupt circle of life much too early It is with faith, hope, prayers, and the work of our church that reigns hope for future immigrants – all immigrants – desiring freedom in these United States.